One of the most significant trends in automotive manufacturing over the last two-plus decades has been a dramatic increase in automation. Large, complex robots have replaced growing numbers of human workers, successfully performing assembly and production tasks with impressive efficiency. The motivation behind this trend is understandable: to reduce or eliminate human error and improve cycle times. But recently we have begun seeing a very different trend emerge: instead of robots continuing to replace human workers, we are actually seeing precisely the opposite: humans are replacing robots. This reversal in a longstanding trend–which has at least slowed the tide of automation somewhat–is being driven by the need for greater flexibility in the face of growing complexity. In response to consumer demand and competitive pressures, product variation is on the rise. That variation changes the manufacturing calculus somewhat, as the required variation and corresponding complexity means that the ability to think critically and independently and adjust to changing circumstances is a priority. In other words, in certain circumstances, people power is once again ascendant. 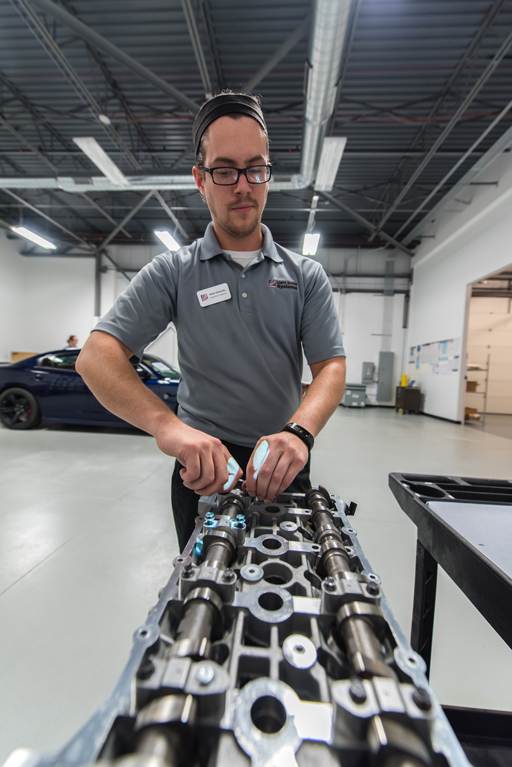 With the complex technologies of connected cars and a growing variety of product options, robots are currently unable to handle the level of virtually endless customization that is required. From a manufacturing standpoint, that variability means that it is often logistically difficult, economically impractical or technically impossible for robots to perform the necessary tasks while simultaneously delivering the flexibility and diverse intelligence required. One of the most prominent examples of a large automotive manufacturer that has reached that conclusion is Mercedes-Benz. The iconic automotive brand got a great deal of attention recently when it announced that it is bringing human operators back to the factory floor, replacing many of the large robots on their manufacturing lines. The idea that Mercedes-Benz is “firing robots” seems to have captured the imagination of people both inside and outside the industry, raising the profile of this trend virtually overnight. The issue seems to resonate, particularly at a moment when complicated questions are being asked about how increased automation and new technologies will impact the employment landscape for so many manufacturing professionals. The reality is that the automotive manufacturing sector is hardly alone when it comes to navigating the complexities associated with automation and the use of robots versus human workers. Different industries have embraced automation to different degrees, and come to varying conclusions about what the value proposition of automation looks like. But the automotive industry is the largest global user of industrial robots, according to a 2016 article in The Guardian discussing the Mercedes-Benz move. The article cites the International Federation of Robotics (IFR), pointing out that the number of industrial robots in operation worldwide was expected to nearly double since 2014. Consequently, any significant changes in the automotive industry could have a potentially profound ripple effect. Mercedes-Benz–along with automakers like Audi, BMW and Toyota, who have all either begun experimenting with or adopting a similar strategy of replacing large autonomous robots with human operators working along smaller, more collaborative robots–recognizes that as good as robots are at performing repetitive tasks, benefits achieved through automation are ultimately outweighed by the amount of time required to reprogram those robots and update production systems to accommodate greater manufacturing variation. Bottom-line realities support that conclusion, as OEMs that have invested the most in automation by no means correlates to being the most productive, while those that employ people where they can deliver higher results than automation have generally achieved more impressive benchmarks in terms of lower costs and fewer labor hours per vehicle. One important piece of the story when it comes to bringing more people power back to the manufacturing floor is the emergence of innovative new tools and technologies that are allowing humans to operate with fewer mistakes, less stress, and greater safety and efficiency than ever before. As product variation increases, human error has typically increased as part of the manufacturing equation, but those mistakes can be dramatically reduced (and even virtually eliminated) with the use of augmented reality technologies. 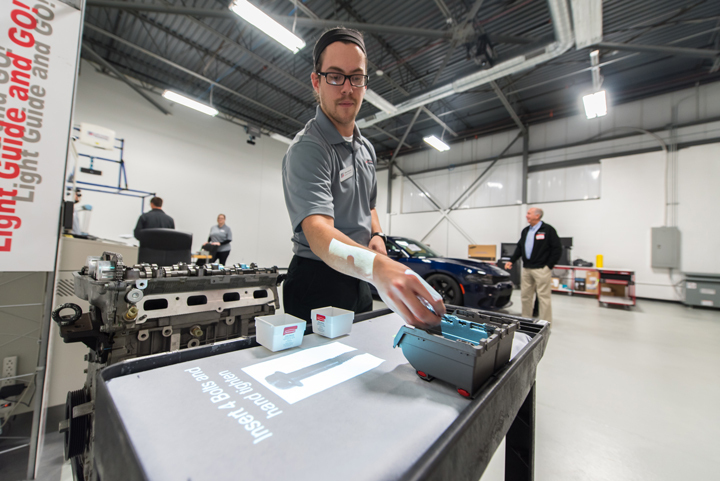 The best of this rapidly evolving category of tools give manufacturing professionals customized hands-on guidance through systems and software that provide dynamic, interactive and adaptive visual instruction along with integrated audio and visual cues. Workers can be guided by a kind of virtual road map projected directly onto the work space, providing real-time instruction, pacing and direction. And “no faults forward” functionality can ensure that the right tools are used, the right steps are completed in the right sequence, and that operators cannot move on to the next step until specified tasks are completed correctly. It is important to note that, while human workers might be enjoying a renaissance of sorts, robots are here to stay. They have valuable strengths, perform certain tasks extremely efficiently and create an ideal solution in circumstances where worker safety is an issue (such as when toxic or hazardous substances are present, or when sharp and heavy materials are being manipulated). But the notion that robots always outperform humans is no longer the conventional wisdom. The assumption that automation is always more efficient and effective can be difficult to shed. Replacing robots with human workers challenges that assumption and runs counter to decades of technical momentum in manufacturing. But with variation on the upswing (for Audi, BMW and Mercedes for example, the number of production variations more than doubled between 2000 and 2015), the likelihood is that we will continue to see OEMs and their professional partners counting on people power–along with new and evolving augmented reality tools and technologies–to get the job done. 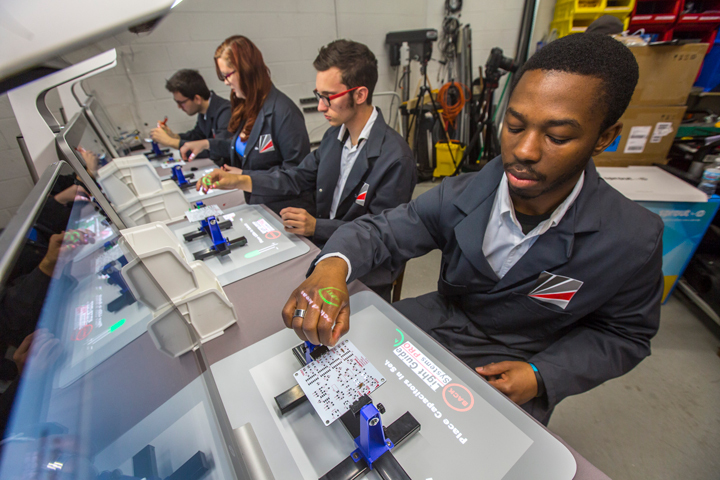 Engineer, inventor and entrepreneur Paul Ryznar created Light Guide Systems and is the founder, president and CEO of Wixom, Mich.-based OPS Solutions.